A passionate dog lover,…staying in Toh Yi Drive… having cared for two of my dogs (both silky terrier) for 18 yrs. Both have passed away. We are a christian family, my wife and me worked as a team, at any one time one of us will be at home to accompany your pet. 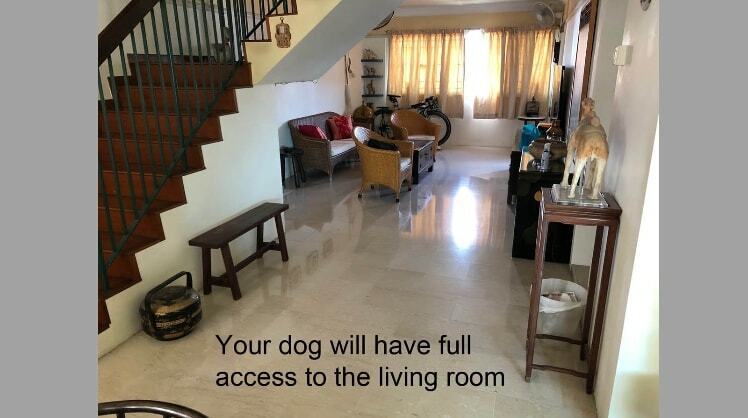 Your dog will have full access to every part of our house (lower level). We have 2 grown up children and all are pet lovers. My daughter is also a great helper when she’s around. I have retired young, dogs will keep me sane ! We house one dog at a time and do not mix with other dogs unless from same owner. This to prevent incompatibility and accidents. We take in dog not more than 10kg. We prefer toilet-trained dog with no serious separation anxiety as they may constantly bark when we go to sleep. This may disturb the neighbours and also our sleep. For overnight boarding – we work on 24 hrs basis. Means if drop off at 3pm, pick up shall be 3pm, with some extended grace period if your schedule does not permit. Not a problem. If happened we reject about your enquiry, not to worry. Not all rejects are total outright rejects - because we may like to seek further clarification first before we hit the pre-approval button. Pawshake has a policy that penalizes pet sitter pre-approvals that didnt turn to actual reservation eventually. For day care, we prefer drop off not earlier than 8.30 and pick up not later than 9pm. Surcharge applies around peak period – Christmas, New Year and Chinese New Year. More videos on dogs in our home. 1) Walking your dog at least twice a day. Their paws will be cleaned after each walk. I’m very careful during walk that your dog will not pick up undesirable objects. 3) Playing and interacting with your dog. 6) Bath and basic grooming like cleaning of ears, clipping of nails. 7) For home visit, I will spend about an hour for each visit with your pet. Transport fee applies dependent on distance. Excellent as usual!!! Exceptional love and care for Benc! David and his family is a dream come true for many dog parents I would say. Especially for us, is hard to find a suitable pet sitter for Archie as he has been ill last year, he needs medication administering plus he is not comfortable with other dogs. It is not easy to find dog sitter who would be willing to look after one dog only or understand Archie's stress when is around other dogs, especially big dog. Archie is a rescued and he has bad experiences with big dog. We truly appreciate David's patience when we explained the many different instructions for Archie's medication plus he diligently carried them out. We were well kept informed about day to day event on Archie. From the pictures I can see David and his family care for Archie like he is their own pet. Archie is extremely happy with them (sometime overly happy and I wonder does he miss us at all). We will definitely ask for their help again. With David, we can truly, travel with peace in mind. I strongly recommend David to other dog parents. Firm command and control of dogs. Good communicator with them.